It was the first (varsity) Auburn score in what would become Jordan-Hare Stadium. Three days later, Hoyt Jolly, an old Auburn chum of McGehee’s, picked up a newspaper, spotted his friend’s name in the Sports section, and wrote him a letter congratulating him on the achievement. Sixty–nine years I acquired it through the magic of eBay. It’s rather awesome, political incorrectness aside. I would have written you sooner but I have been mad at you ever since you sent me that card from New Orleans advising me to bet on Auburn against Tulane. By George, I lost a couple of grand on that contest because of that tip. Boy, I want to be among the first 10,000 to congratulate you on being the first Auburn Man to cross the double stripes in the new stadium. I remember saying, one day, that it would be swell if you could make the first touchdown and sho nuff, I pick up the paper and find that you did just that. I know how good you must have felt because I had the same sensation during my brilliant career at Auburn High, except that I never scored, nor helped dedicate a stadium, nor even played in but one game (Auburn Hi 57 – Notasulga 0). I am expecting youse guys to defeat Tenn. I room with a damnyankee (one word in these here parts) who kids me all the time about Auburn so I want you to give me a chance to get him back by trouncing the Vols, handily. I know that may sound like a big assignment but it isn’t so hard. There are just two things you will have to do— 1) score & 2) keep them from scoring. You might pass this little piece of advise on to the “Little General” and the players if you don’t think they’d get huffy about an Alumnus butting in. I don’t like Texas but I guess it’s O.K. as A HOLE. Especially do I dislike San Antonio. If you don’t speak Mexican it’s very hard to get along in that greasy metropolis. My motto is “Forget the Alamo”—if you can. I am also having too much trouble with these flying machines. My instructor says that aside from being mechanical, not using my head, and having no coordination I am a very good pilot. All of which leads me to believe that I may be back on the streets of Auburn soon—a wash out! Only hope that I stay in here long enough to use up this stationary that a tough private bulldogged me into purchasing. Taking every thing into consideration, if I had it all to do over again, I’d leave flying to the birds and [illegible] and I’d settle down to a life of ease somewhere far removed from civilization with all it’s new fangled contraptions. Well Babe, being as this is the longest thing I’ve written since my freshman English theme, I’m about wore out. Give your mother, Mary, and Jimmy my love and all the boys my best regards and answer this letter pronto, podner (I’m getting to be a regular little westerner). Players from the 1939 Auburn team reenacted McGehee’s touchdown 50 years later during halftime of the 1989 Florida game. That is awesome! Thank you for sharing that. Not really that non-PC considering the times in which it was written. I’m somewhat shocked at how it pretty much sounds like a regular e-mail I would get or send to my friends. I was expecting a bunch of “chip, chip cheerio my dear chap” kind of stuff. I guess it really is true, the more things change the more they stay the same. War Eagle! Babe McGehee was my Dad. He passed away in Oct. 2005. My Mom, Suzelle Hare McGehee, passed away in Oct. 2003. The stadium was named after her father, Cliff Hare (Dean of Chemistry School; played on first AU team; head of Southern Conference (predecessor to both SEC and ACC). I cannot tell you how much it moves me to see this letter. Dad used to tell me stories about his old friend, Hoyt Jolley. To see a handwritten letter from him to Dad makes me feel like he is still here with us. You have made my day. I will share this with my five siblings (5 of 6 are Auburn Alums; the oldest went to several Ivies and overseas. Strangely enough, the surviving members of the 1939 team recreated the play at halftime of the AU/FL game in 1989, exactly 50 years to the DAY from Dad’s touchdown. Auburn went on to win the 1989 game on a last play touchdown pass to Shane Wasden. Dad told us after the game that Wasden caught his pass in the EXACT spot where Dad had caught his, 50 years earlier! I was recently diagnosed with ALS, so this has really brightened my day. Thank you, Rob, for all that you and yours have done for my alma mater. What a great piece of Auburn history! Thank you for sharing it. 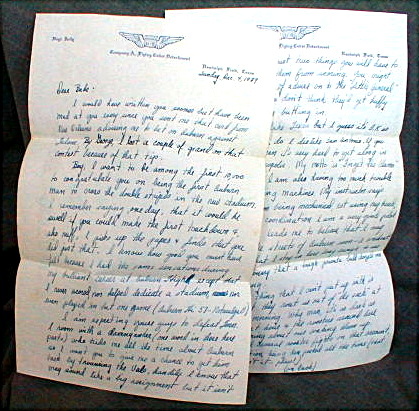 I myself picked up a Shug Jordan letter to a fan on eBay years ago. It was probably signed by his secretary, but I enjoy having it. You never know what you’ll find on there. Awesome post! Thanks for the comments as well Rob. I concur with Aeronaut, thanks for all you and yours have done for Auburn and for many Auburn men and women! Nice article Jeremy…always enjoy your work. Thought the comment questioning whether the players might get “huffy” about an alumnus butting in was priceless. Boy have the times changed. 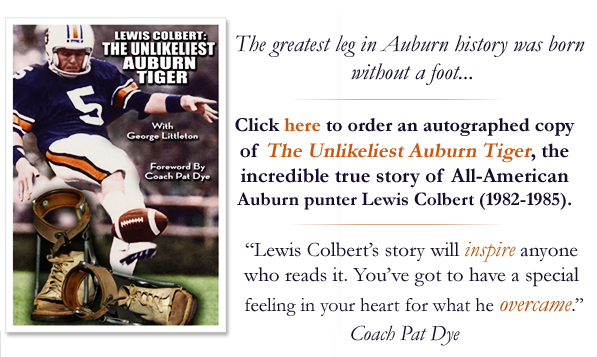 Yes….this was such a great article!…..taught me much I never knew…..I was a kid in Auburn…..our family knew and loved Suzelle, Babe and Susan (the only kid who was a non-Auburn grad? )……..I would really like to hear from Rob McGehee…[email protected].